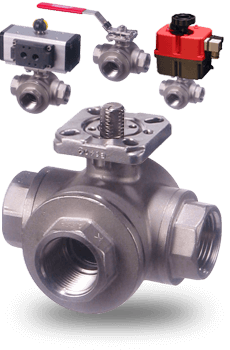 Diverter valves are one type of 3-way valves. Unlike modulating and mixing 3-way valves that combine two inputs into one output, diverter valves separate one input into two outputs. Diverter valves are frequently used in control processes because they are less expensive and require less space than using multiple 2-way valves to divert flow. Although multiple 2-way valves can achieve the same goal of diverting, or mixing, the additional cost of purchase, installation, and maintenance on two 2-way valves, and the larger footprint required, more than justifies the use of a single 3-way valve. Factoring in the cost of actuation, a single actuated 3-way valve can save thousands of dollars over multiple 2-way valve configurations. Manufacture of paints, solvents, and other corrosive media require special valve construction material and seals. For example, paint adherence to an EPDM seal can create adhesion problems, which is why stainless steel valves with silicone free seals, such as Assured Automation’s 33D Series, are preferable for these applications. The 33D 3-way valves’ body, ball, and stem are all made with 316 Stainless Steel, the seat with RPTFE, and the stem seal with RPTFE, and is available in sizes from ¼” to 2″. It is designed to perform in temperatures from -20° to 400° F, under a maximum pressure of 800 PSIG. When determining which type of actuator to use – pneumatic or electric, Assured Automation’s actuator decision tree is a helpful reference. In our experience, we find that roughly 70% of the 33D Series valves are sold with pneumatic actuators, and 30% with electric actuators. Pneumatic actuators provide rapid actuation and high cycle life, and are safe when working with flammable media. When selecting a pneumatic actuator, the instrumentation engineer has the choice of a rack and pinion style or scotch yoke style actuator. Pneumatic and electric actuators are both available in spring return models for emergency shutdown, or double acting when fail to the last position is sufficient. If manual actuation is all that is needed, the 33D Series stainless steel 3-way valve is available with a lever and locking handle. A paint producer generates product in batches, alternating between two filling stations. To keep a continuous flow, as one tank or reactor is filled, a second tank or reactor is prepared for filling. When the first tank is full, the flow needs to be diverted to the second tank. This way the filling process can alternate between tanks as each batch is produced. Assured Automation’s 33D Diverter Valves allow the paint product to switch between two flow streams that fill each tank. The 33D multi port valve is especially well suited for paint production due to its stainless steel construction and RPTFE silicone free seals. RPTFE, also referred to as Reinforced Teflon®, increases the temperature and pressure ratings and provides greater resistance to wear, increasing the cycle life. RPTFE silicone free seals are well suited for use with petroleum-based products and solvents. A production line that feeds Sodium Hydroxide to two different process lines, each with different flow requirements – one with a fast flow, and another with a slower flow – makes it dangerous for plant personnel to manually manipulate flow components. The original piping was set up with an orifice in the piping of one of the outlet pipes. Cleaning the orifice piping created risk to the plant staff. Replacing the orifice piping with the 3-way ball valve that fed into different sized pipes was found to be a better solution. Sodium Hydroxide’s corrosive nature requires special materials of construction for long service life and reliable operation. Assured Automation’s 316 stainless steel 3D multiport valves are well suited for this type of application. If you are designing a flow system for caustic media, for paints, inks, or solvents, and find it helpful to feed multiple process lines, the 33D Series silicone free 316 stainless steel full port 3 way ball valve with its RPTFE seat and stem seal, provides long service life and reliable operation. This entry was posted in Latest News and tagged 3-Way Diverter Valves, Ball Valves, Diverter Valves. Bookmark the permalink.